Nine Turkish universities were included in the BRICS & Emerging Economies Rankings 2016. 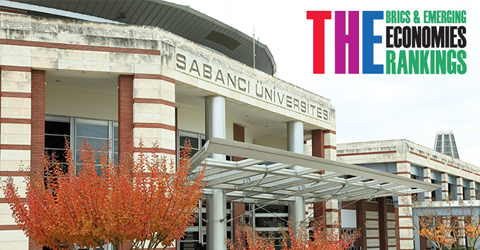 Times Higher Education’s BRICS & Emerging Economies Rankings include the top 200 universities in Brazil, Russia, India, China, South Africa and 35 other emerging economies, and Sabancı University ranked 22nd. Similar to the World University Rankings, the list uses a methodology that covers Teaching, Research, Citations, International Outlook and Industry Income using 13 performance indicators. The difference of the BRICS rankings is the greater weight placed on Industry Income and International Outlook as the list includes the best universities in emerging economies. Together with Sabancı University in 22nd place, other Turkish universities on the “BRICS & Emerging Economies Rankings" are Koç University (13th), Bilkent University (41st), Istanbul University (62nd), METU (64th), ITU (69th), Boğaziçi University (71st), Anadolu University (106th) and Hacettepe University (168th).